After completing the Webelos program and earning the Arrow of Light, Cub Scouts "cross over" into Boys Scouts. This usually happens in January or February of fifth grade. Most of the Visitation Cub Scouts join Visitation Boy Scout Troop 14, which meets in Podesta Hall twice a month. Boy Scouts can attend campouts through the year, high adventure summer trips to places like New Mexico and Colorado, and earn merit badges in a wide variety of topics. 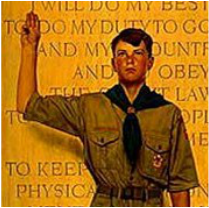 Many of our Boy Scouts earn the highest rank of Eagle Scout. Visitation’s Pack 14 volunteered at Feed My Starving Children in Schaumburg. We were able to help pack enough food to feed 91 kids in eSwatini (formerly Swaziland) for an entire year. We also raised a total of $460 for FMSC during the bake sale that we had on March 10th and through additional donations.